“Because you never get a second chance at making a first impression.” That antagonizing line from a deodorant commercial was invented by someone who has forgotten their childhood. Thankfully, actress and author Jamie Lee Curtis is around to remind us of the carrot-and-the-stick challenge of achieving the first evers that encourage forward momentum in life. And, of course, it took a child, a couple of them really, to remind her of the glorious and exhaustive process of not only trying something for the first time, but the reward of the mounting failed attempts that accumulate into accomplishment. 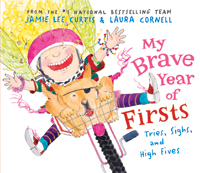 “My Brave Year of Firsts, Tries, Sighs and High Fives” is the chronicle of real-life events in the most recent years of family friend Frankie Rippo, 9, and Curtis’ goddaughter, 9-year-old Zoe Timberlake Walker. Curtis will be at Iconoclast Books in Ketchum on Sunday, Dec. 23, to read from the book and reunite with her inspirations. This is her 10th book, illustrated by Laura Cornell, each one a testament to the unfolding chapters of a child’s growth, but also a voice that parents can learn from and use to understand the world from a child’s perspective. Each book that followed gained an enormous following, covering consciousness-raising topics that parents and kids loved equally. The most recent hat trick evolved from an encounter two summers back at Java, the coffee house where Frankie’s mom and dad make their living. Proud papa Todd began ticking off the list: biking around Alturas Lake loop, galloping on a horse, riding a dirt bike. Curtis started taking mental notes. And, she cross-checked with Zoe to round out the story. Zoe and Frankie were friends from ice skating. And although Zoe has since moved from Hailey to San Francisco, she will be back for the book signing. Frankie said the writer took a few liberties with the content, but she clarifies fact from fiction. That first jump required a major leap over anxiety “because it was so high up and a catfish might bite off my toes. I felt so brave!” But that’s life, Frankie reasoned: seeing an obstacle as an opportunity and going for it. She credits working in her parents’ shop for reinforcing her try-it-and-stick-with-it attitude. Her advice to younger kids struggling with bravery? Giving a voice to children, even before the real world has given them audience, is part of the formula. When: Sunday, Dec. 23, 4-6 p.m.
Where: Iconoclast Books on Sun Valley Road, Ketchum.